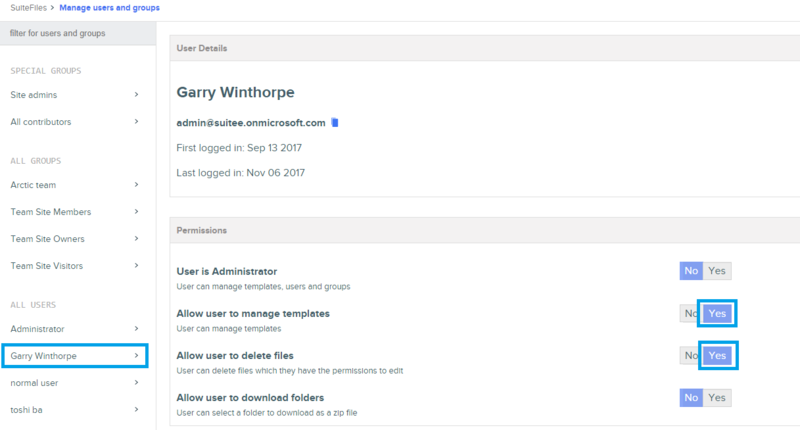 To access users permissions as well as security groups, click on the More tab, then select "Manage users and groups"
User is Administrator will add the user to the team site owners group making them a SuiteFiles admin and providing them permissions for everything in SuiteFiles, any folder permissions set won't apply to SuiteFiles admins. Allow user to manage templates will allow the user to create, edit and delete file and folder templates as well as be able to access the template manager. Allow user to delete files will allow the user to delete folders and files if they have the edit folder permission. Allow user to download folders will allow the user to download folders including all the folders content to a zip file.